Walking with Jesus: Day 152: John 1:1-18 & Psalm 148 - Who is Jesus? The Gospel of John is distinct, clearly different in content, scope and purpose from Matthew, Mark and Luke. The first three Gospels have been called "synoptic" Gospels, providing a "synopsis" (summary) of the life and ministry of Jesus. John's Gospel is less synopsis and more exposition, less summary and more explanation, less history and more theology, less narrative and more Christology. What does all this mean? John's driving focus is to exalt the glory of Christ and put the fullness of the person and work of Christ on display for all to see and believe. John begins his Christ-exalting Gospel with a beautiful, poetic prologue of 18 verses. He begins with a unique title for Christ, "the Word." This is the only place in Scripture where Jesus is so explicitly called "the Word," though John makes it clear that whenever the Bible speaks of "the Word," it is pointing in the direction of Jesus. When John says that Jesus is "the Word," he means . . .
1. 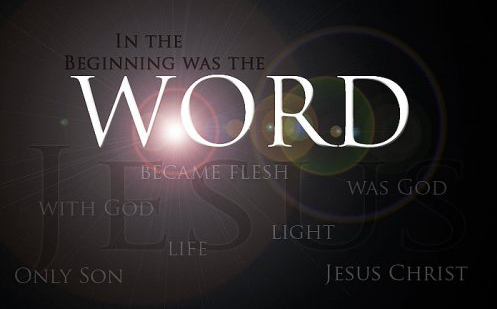 Jesus is the eternal Word. "He was in the beginning with God." 2. Jesus is the Word of creation. When God spoke the universe into existence, Jesus was the creative Word God spoke. 3. Jesus is the Word who is God. God's very Word is fully God because He is God's own wisdom, God's own mind. This is Jesus: eternal, creative, fully God, life, light, incarnate, full of grace and truth. Do you know Him? Have you received Him? Do you believe in Him? praised by all Your hosts! Let them all praise Your name, O Lord! For You commanded and they were created. You gave a decree, and they shall not pass away. stormy wind fulfilling Your word! Your majesty is above earth and heaven. from the lips of the people who are near to You.